Big Sky Builders and General Contractors. 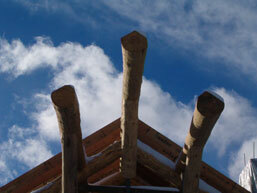 Baker Creek builds custom log homes and timberframe homes in Big Sky, Montana. "Our cabin is "Off-the-Grid" and John designed and installed our solar electrical system. He also installed a rain water catch basin that provides all of our non-potable water. These systems have performed flawlessly, thanks to John." The Owner-Builder relationship is founded on trust. 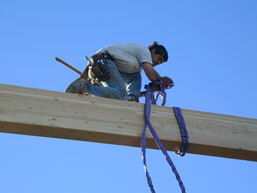 And throughout our projects we work to earn and maintain the highest degree of trust and confidence. By doing so, we enjoy long term relationships with our clients. We really enjoyed working with Baker Creek Log Homes. John was on time and on budget. Our home is wonderful. If we ever were to build another home, we would use John again. He's a great person. I love the way my house came out and I love the workmanship. John worked very well with my architect who is based in Canada and there was a lot of teamwork in the way the house emerged. John's crew and his subcontractors were a talented bunch and were a pleasure to work with. It was very important that the environment around the house be preserved and John did not lose a single aspen tree. I was especially impressed with the way John responded when a piece of equipment failed during my second winter in the house. It was over the Christmas holiday and all of the kids and grandkids were visiting. John and a laborer were over within an hour and hand-dug the access through two feet of frost in order to replace the pump. He saved our holiday. At six years old the house is holding up exceptionally well and I love it. John erected the logs for our 1,000 square-foot cabin, located on the Wade Lake bench south of Ennis, starting in November, 1991. He and his crew proceeded to finish the cabin during the winter of ‘91-’92, completing it in June. We can not say enough about John’s conscientious and skillful work. We have remained entirely satisfied with the high-quality finish of our cabin. There has been no settling of the logs. For example, the snug fit of wallboard around the ceiling logs looks the same as when it was completed in ’92. We found John to be highly skilled, as well as very responsible and conscientious with his work. He readily accepted suggestions and was always willing to make changes. To have a contractor whom we could trust was extremely important to us, being 700 miles away with no opportunity to visit the site during that long winter. Our cabin is "Off-the-Grid" and John designed and installed our solar electrical system. He also installed a rain water catch basin that provides all of our non-potable water. These systems have performed flawlessly, thanks to John. In the summer of 2000, we hired John again to craft and erect the logs for our bunkhouse which sits next to the main cabin. The quality of the craftsmanship for the bunkhouse is outstanding as was that of the main house. This is also the opinion of all of our friends and neighbors who have seen the house and bunkhouse. We are totally pleased with the work John has done for us and can enthusiastically recommend John Palm as a log home builder and general contractor with no reservations. John Palm built an addition to our house in Bozeman. He did a great job and we feel the addition to be extremely well-built. What probably impressed us most was what happened when we ran into some unexpected site conditions while digging the hole for the basement. John knew just what to do and took care of it quickly and economically. We recommend him highly and would certainly hire him again for work in the future. On behalf of BIH I wanted to thank you for your work and help on the Fourth and Peach Project. I appreciate the care and workmanship you contributed to its overall success. Palm Construction and other contractors and professional people have helped in a very real way the first nine families that now live there. Over the next thirty years, hundreds of families will benefit from your work. Palm Construction submitted the low bid on public notice format for this project which is partially funded by a HUD HOME Grant. General and subcontract construction has proceeded on schedule and within original budget parameters, despite the winter season. I would add that all changes and updates have been instigated by management, design team and mechanical suppliers. All price changes have been reasonable and the project has stayed on schedule. Communication between general contractor, employees and subcontractors with the design team has been open, cordial and has resulted in a smooth and rapidly progressing project. The quality and craftsmanship has been met with admiration by all involved with the project. John Palm acted as General Contractor in charge of the remodeling at the Cuncannan Residence, and also did most of the work himself. This work included masonry, carpentry, electrical work and plumbing. Although the project was small in scope, John approached it with interest and worked very hard to keep costs in line while providing the best possible finished product. His standards are quite high, and he rejected some of the work provided by others on the job because he was not satisfied. He also developed a good rapport with my client who is quite satisfied with the outcome. I would work with John on future projects if the opportunity arose. As the Superintendent of Schools, I am very pleased with Palm Construction’s performance as the General Contractor for our 9,200 square foot elementary school addition. Even though unstable soils conditions were discovered at the outset, the project was completed on time and within budget. Mr. Palm worked diligently with the architect and soils engineer to arrive at the quickest, most economical solution to the problem and kept the project on schedule. This allowed the students to enter the new school year without any disruption. At the one-year walk-through the architect and our maintenance staff found all aspects of the project to be in good working order. I would be happy to have Mr. Palm bid on additional school expansion projects that will be necessary in the near future.